Our people, including engineers, designers, project managers, craftspeople and management, are totally committed to the continual improvement of our organization and products. 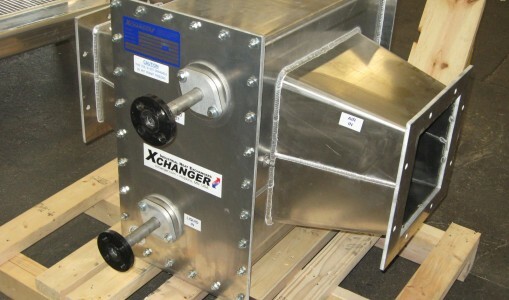 Long before the concepts of TQM and ISO 9000 swept the business community, we at Xchanger understood that to be in business, we had to be a reliable manufacturer of quality heat exchangers. We have taken these initial notions about reliability and quality to the point where they are today: a complete quality system, based on the ISO 9000 template. 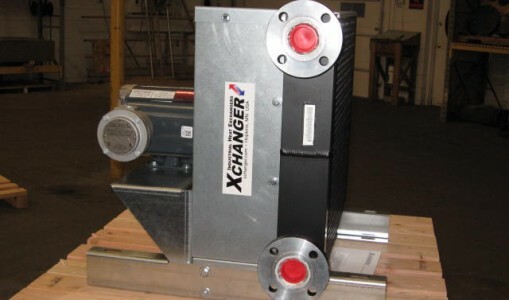 Our quality procedures are a real part of everyday business at Xchanger. Clear written descriptions exist for all kinds of activities, from engineering to shipping. 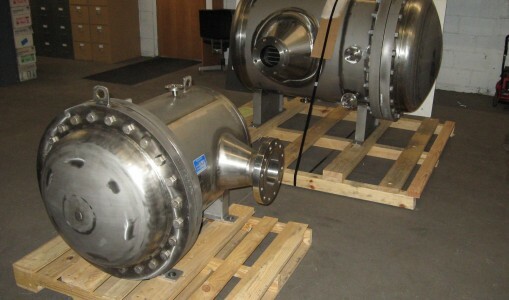 The use of this ISO 9000 based system has increased product quality and heightened the involvement of our personnel in the improvement of procedures. The results have been tremendous. We have simultaneously decreased lead times, increased quality, and decreased pricing. 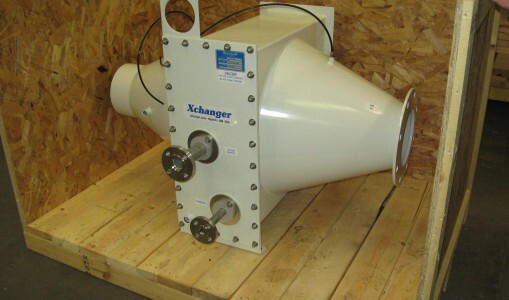 Xchanger is an approved vendor for many companies that are certified in ISO 9000. These include many of the Fortune 500 and major international companies as well. Below is a brief plant tour. Tubes are purchased in long coils. They are straightened and bent into 180º “hair pins”. By making this bending operation before assembly, two return bend seams are eliminated. 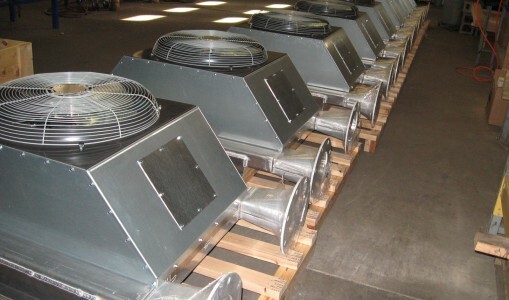 This reduces cost and provides maximum strength and integrity. Fin material also comes in coils, as seen in the left side of this photograph. The fin material is unrolled by an automatic feeder to a fin press. 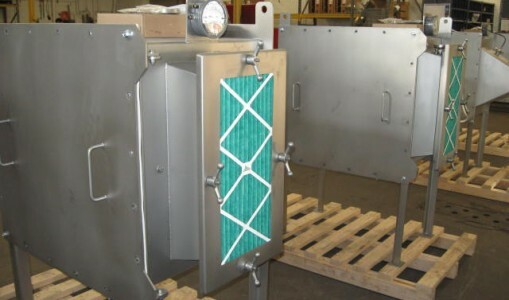 On the other side of the fin press, fins can be seen falling from the vacuum hood, which holds them in place until the last holes are made and the fin is cut off. In the foreground, pins that are used to keep large stacks of fins in order can be seen. In the lower left, rolls of unused fin stock are waiting. A tall stack of fins, which are held together with pins, sits on a cart. On the right side, fin material is being fed into the fin press. After being punched in the fin die, these fins are ready to be inserted in a casing. The pins are still keeping the whole thing together, but these copper fins are now installed in a stainless steel casing. Now that the “hair pin” tubes have been slid into the fin banks (not unlike the slide on a slide trombone), the pins are no longer necessary. These stainless steel tubes must be expanded into the fins. During expansion, the tube diameter is enlarged. 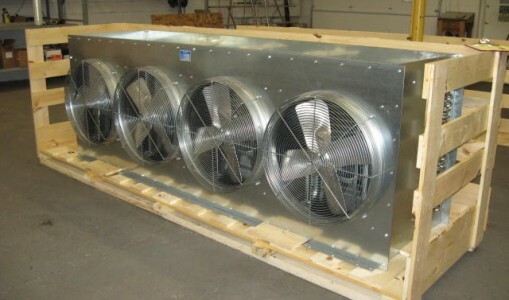 This makes a strong, permanent bond between the fin & tube, which is necessary for good heat transfer and a structural integrity. These copper tubes are also ready for expansion. 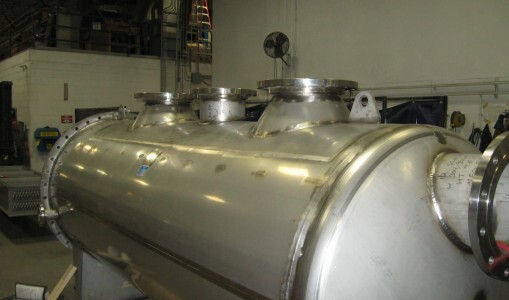 It is easy to see the longer of these stainless tubes, which will be connected to the headers. These tubes are also waiting for expansion. The blue machine is an hydraulic pump capable of 20,000 PSI. This pump fills each “hair pin” with water, and pressurizes it to a set-point, at which the tube is permanently attached to the fin bank. After expansion, 180º “return bends” are gently tapped into the open tubes opposite the “hair pins” of these copper tubes. The same thing happens for stainless steel tubes. The return bends are then attached to the tubes. In this case with copper tubes, brazing is the normal method. Brazing takes about 5 seconds per joint. Return bends are welded to these stainless steel tubes. This operation takes about 4 minutes per tube. End caps and hubs are welded to the headers before the header assemblies are welded to the tubes. Stainless steel headers are ready to be attached to tubes. With the headers attached and return bends brazed, the next step is the pressure test. 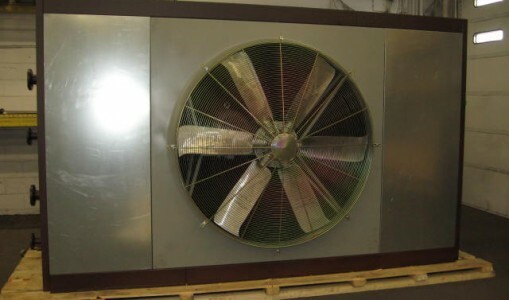 This refrigerant evaporator is also ready for a pressure test. This is the test tank. After final welding, every single unit is immersed underwater in this tank. The tubes are then pressurized with 300 PSI dry nitrogen. Any leaks are easy to spot. 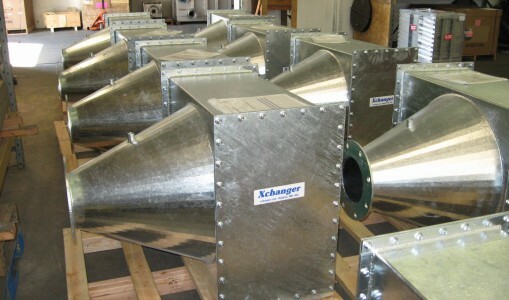 These condensers have passed the pressure test and are ready for final assembly in an LC Series heat exchanger.